Workout Secrets of the Stars. Whether they’re modeling lingerie or dancing on stage of tens of thousands of fans, many celebrities have to stay in perfect shape, and that’s not easy. While diet plays a big part, it’s exercise that makes the biggest difference. Check out some of the best workout secrets of the stars, straight from their personal trainers, some of which are celebrities themselves. From Beyoncé’s plyometrics to the exercise that helps Jennifer Aniston keep her thighs in perfect shape, here are a few excellent celebrity workout tips. Also known as jump training, plyometrics are intense exercises that many athletes and martial artists perform in order to push their limits and increase performance. According to Beyoncé’s personal trainer Marco Borges, the pop star does sprint interval and body-weight squats, but plyometric exercises also play a big part in helping her stay bootylicious. Some of the best workout secrets of the stars can be as simple as making a few tweaks to the basics of a gym session. Joe Dowdell, who trains celebrities like Anne Hathaway and Claire Danes, advises that the resting time between sets shouldn’t be the same. When you start working out, you only need around 20-30 seconds, and you can increase that time up to 60 seconds towards the end of your workout. 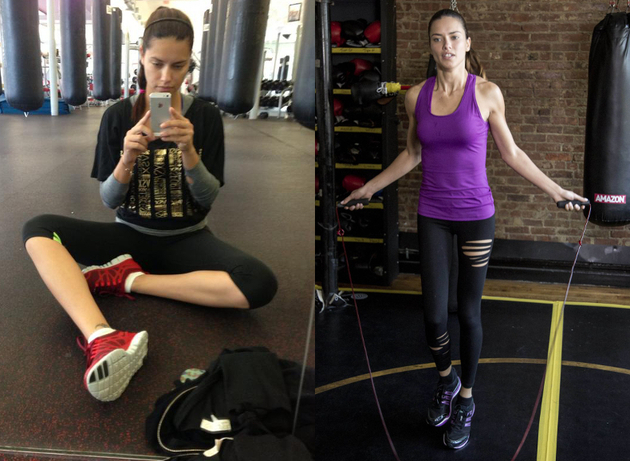 Michael Olajide Jr, Adriana Lima’s personal trainer, helps her stay in shape in the gym, but has also taught the Victoria’s Secret Angel how to jump rope at home. The secret to a good workout with a jump rope is aiming for a short and intense session, mixing in side-to-sides, cross overs and double unders. In order to get better results, you really need to focus on one muscle with four different exercises in a row, according to Michael George, who trains Reese Witherspoon and Julianne Moore. Doing four different exercises for one muscle, three sets each with no resting, is one of the workout secrets of the stars. In order to stay in shape the right way, intense gym workouts a few times a week might not be the best way to go. Gunnar Peterson, the celebrity personal trainer who also worked with Sofia Vergara and Kim Kardashian, advocates for having a daily routine that’s less exhausting than a full workout. By knowing how to set your goals so you don’t feel exhausted, you can easily create your own daily workouts. While you may feel like you’re saving time by strength training with dumbbells and alternating between each repetition, Harley Pasternak recommends focusing on a single arm or a leg at a time. The celebrity trainer says that resting one side while working the other leads to burning more calories, and it may be one of the most important workout secrets of the stars. Exercising on an empty stomach isn’t always a good idea, but Gregg Miele, who helps Chloë Sevigny stay in shape, recommends a little cardio before breakfast. You can also boost your metabolism with coffee before the cardio, but make sure that you’re not doing strength training on an empty stomach. Kathy Kaehler, who trains Jennifer Aniston, shared with Marie Claire an excellent exercise for your thighs, that definitely qualifies as one of the workout secrets of the stars. Put 10 playing cards on the floor, then squat and pick up one of them, and shuffle four paces to one side. Squat again to put it down, then shuffle back and repeat. Celebrity trainer Tracy Anderson, who’s worked with Jennifer Lopez, Madonna and Gwyneth Paltrow, bans TV from the gym. Staying focused even on the treadmill or elliptical burns more calories. One of the easiest workout secrets of the stars is to make sure that you write down every goal that you achieved in order to stay motivated. David Kirsch, who helped Heidi Klum get back into shape after giving birth, advises all his clients to stay motivated this way. Fashion forward and beauty oriented, always interested in whatever is trendy and hot hot hot!